So today I thought I would share our new "book bag" area and it includes #shiplap! 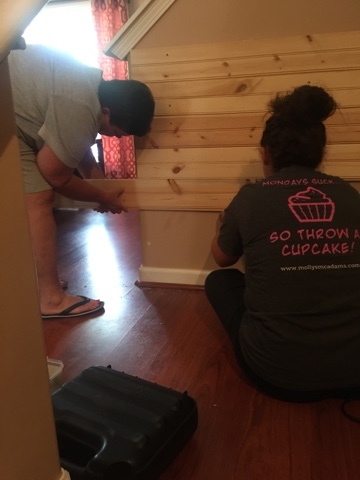 My mother in law and I channeled our inner Chip and Jo and put up #shiplap! 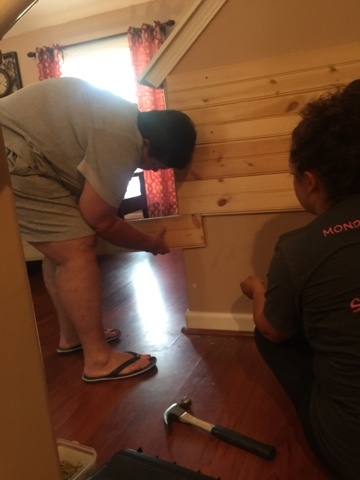 The area where we put up the shiplap was a line of hooks! I loved the look for a while! As book bags got heavier the hooks started pulling out of the wall!! I have been wanting to redo this little nook for a while, I just didn't know what I wanted to do!! So I called my sweet mother in law and asked for her help! She is GREAT at decorating and helping me make a vision come to life and she can usually make it look way better than I can! She has helped me decorate most of my house!! When we got home we measured them and then cut them to the desired length! 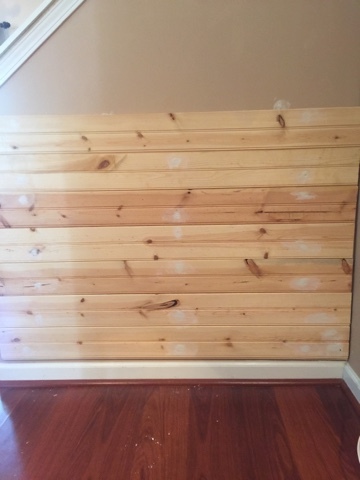 I screwed the boards into the wall! 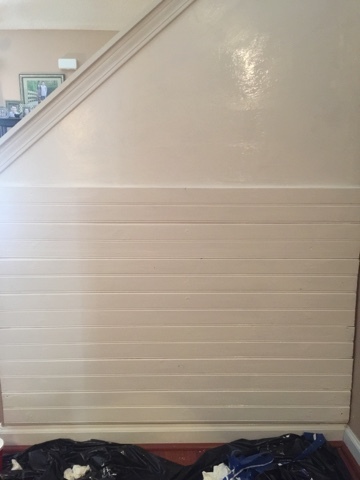 I wasn't sure how I was going to like the #shiplap not going all the way up the wall, but as you can see this wall is the side of our staircase! I was scared it would look to "choppy" at such a funky angle! I am VERY happy with the final result! The cubbies are from Michaels and they will hold their shoes, jackets, important papers, etc for school! I couldn't find the cubbies online but they are considered a basket! The bench has been in my mother in law's family for years! It was her grandfather's!!! Here is a closer look at the "gallery" wall! These two signs are from my sweet #maker friend Robyn at Pink Robyn Decor! She is AMAZING! I hope Ian and Ella "shine" each and every day! I also pray that they know "they are loved"
I made this chalkboard sign with my Cricut!! "Every Child is gifted. They just unwrap their packages at different times"
I am in LOVE with this little makeover! It makes me happy when I walk up the stairs from the garage!! I also wanted to share the kids homework desk!! The desk is in the living room and to the left of the fireplace! Ella LOVES to play teacher, so she uses the monitor as her "smart board"
pencils, colored pencils, twist crayons, wooden colored pencils, and skinny markers! It is great to move to the floor when Ella likes to color and watch TV! It keeps everything organized!! When do you guys start back to school??? What is your routine during the school year? 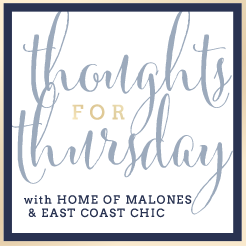 Do you have any ideas that you would like to share that makes your evening routine easier?? 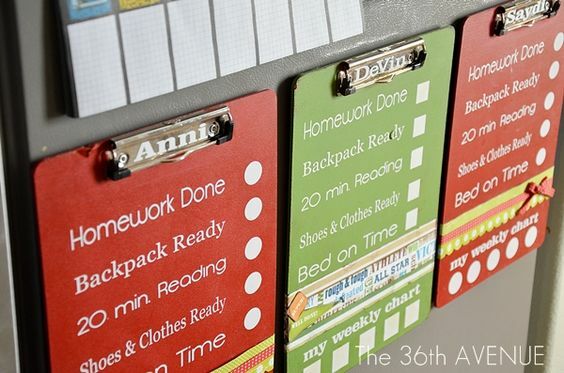 I have thought about making my kids these clipboards with their "after school/evening" routine because I constantly feel like I am asking "Have you done your homework, have you laid out your clothes for tomorrow, go take a shower, have you read for 20 minutes, etc?" As much as I am dreading summer being over, we are to the point where we need a routine!! 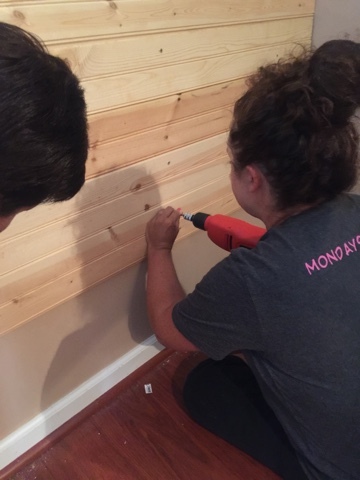 The shiplap looks incredible! I can't believe your school starts in 10 days! We still have 4 1/2 weeks of summer left! Thank you!! I wish we had 4.5 more weeks! But we get out in the middle of May! LOVE it!!! So good - turned out so nice!! We start on the 8th!! I can't believe it either!! I tried those little check lists in kindergarten and they were too young then - maybe now it would work better!! Heather! The shiplap!!!! It looks absolutely awesome! Great idea where you put it =) I love the pictures and the arrow that you have above it, it looks great. Where did you find the wooden crate with the mason jars? I love it and how perfect to hold pencils, colored pencils, crayons and markers. That would make my life easier. I feel like I am forever picking crayons up. Haha =) I can't believe you guys start school so soon. We go back the end of August. I love a a routine during the school year. Sometimes it is super hard to stick to it, but it makes life easier. 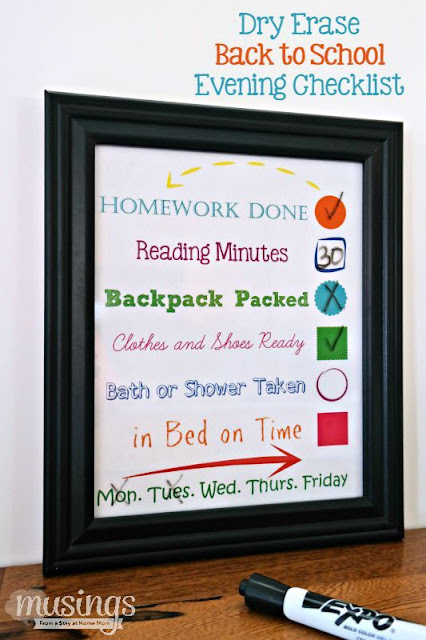 I love the idea of the clipboard for the kids to check off what they have done.